Today was Day #5 of Chocolate and Cinnamon Theme Week, and today's bar was another successful blending of cinnamon with chilies. While cinnamon came from Asia, it partners so naturally with chocolate that it's easy to forget that the original spice used with cacao beverages in Latin America was likely a type of allspice. Cinnamon was introduced many years later. This No. 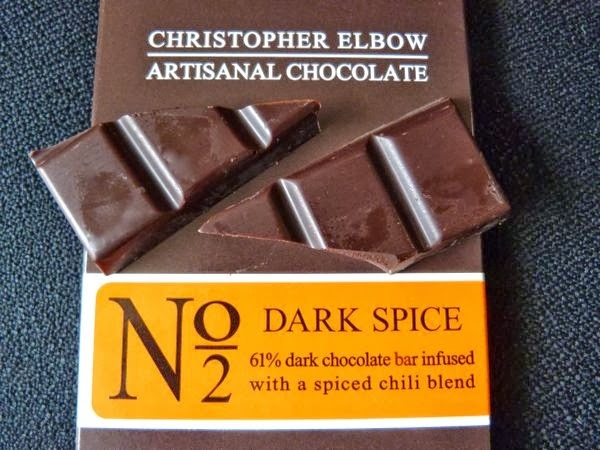 2 Dark Spice bar (part of a numbered series of bars) from Christopher Elbow (Kansas City, MO) possessed a captivating blend of ancho and chipotle chilis. 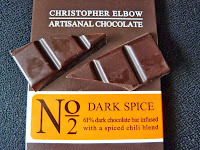 These flavorful ground chilis didn't burn, but rather the infusion lingered and complemented the 61% dark chocolate base. Cinnamon and spices heightened the well-balanced warmth.